MSF runs emergency medical programs for asylum seekers and migrants on the border shores of a number of countries, calls for minimum standards in their reception, and denounces their systematic detention. Newly arrived migrants, asylum-seekers and refugees are gathered in a men's first-aid holding center in Lampedusa. MSF workers identify passengers in need of medical assistance while they disembark from a boat from Libya. Despite increased policies to contain arrivals and stricter border controls at the European Union’s southern frontier, the number of migrants landing in Malta increased in 2008, with more than 2,700 new arrivals. In the first two months of 2009, 758 migrants landed on the island. Undocumented migrants and asylum seekers set off to Malta on boats leaving the coast of Libya, on journeys that can take up to seven days. Nearly 60 percent originate from countries affected by conflict or widespread violations of human rights—almost half of all newly arrived migrants come from Somalia. Although most of them will eventually be granted refugee status or humanitarian protection by Maltese authorities, they are sent to detention centers for up to 18 months. In the centers they face overcrowding, inadequate sanitation, and poor general living conditions—an environment that has damaging effects on their physical and mental health. 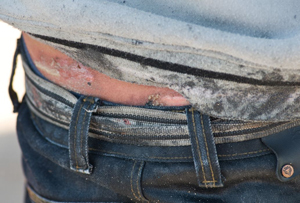 An MSF patient newly arrived in Lampedusa from Libya is treated for wounds. In August 2008, MSF started providing health care and psychological support to undocumented migrants and asylum seekers in Malta. Its activities included medical assessment of new arrivals soon after their transfer to the detention centers, and follow- up medical consultations; psychological support; medical triage and health and hygiene promotion. MSF also identifies and refers vulnerable groups such as pregnant women, children and sick people to the Maltese authorities in order to obtain their release from detention. 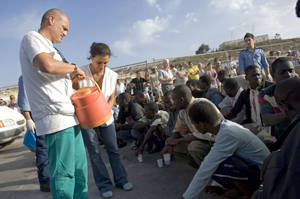 Between August 2008 and February 2009, MSF provided 3,192 consultations to migrants and asylum seekers in Malta. Among the newly arrived, medical complaints were often a result of the harsh conditions of the journey, as most had spent days on a boat with limited food and water, unable to move, exposed to sun and rain. Musculoskeletal, dermatological, urinary, and gastrointestinal health problems were common. MSF also provided healthcare in detention centers in Malta, but it soon became clear that the impact of this healthcare was limited by the living conditions in the centers. About 17 percent of the health conditions diagnosed by MSF medical staff were respiratory problems linked to exposure to cold and lack of treatment for infections. Skin infections reflected overcrowding and poor hygiene in the centers. After repeatedly drawing the attention of the Maltese authorities to the appalling living conditions in camps for detained migrants, MSF decided to suspend its activities inside detention centers and publicly denounced the living conditions and associated risks to which migrants and asylum seekers were exposed. In its report "Not Criminals," MSF uncovers the unacceptable conditions of detention and their impact on the physical and mental health of the migrants and asylum seekers in Malta. MSF continues working in open centers for migrants. Once asylum seekers have their applications successfully processed and are granted refugee status, they are transferred to open centers, where they have freedom of movement. There, MSF facilitates migrants’ access to public health services, provides mental healthcare and carries out health promotion activities. Since 2002, Italy has experienced a growing influx of undocumented migrants and asylum seekers. Excluded and exploited, they bear the brunt of increasingly strict measures to deter migration. MSF provides healthcare to the migrant population, including seasonal migrant workers, and lobbies for better access to healthcare services and improved living conditions for this excluded population. Napoli (Naples), the capital of Campania region and the third largest city in Italy, is marked by high levels of criminality and poverty. The city attracts large numbers of migrants, with an estimated 25,000 living in unacceptable conditions. In order to improve their access to healthcare, MSF has set up clinics integrated into the country’s national health services with a view to handing them over to authorities in the future. The assistance is provided in a manner that ensures their identities remain anonymous. In 2008, MSF carried out nearly 5,000 consultations in the clinics. Every year, the agricultural lands of southern Italy attract thousands of migrants, a cheap and invisible labor force subjected to exploitation and intolerable living conditions. Since 2005, MSF has worked in Sicily, Puglia, Calabria and Campania to provide assistance to this population. In 2008, MSF provided 719 consultations and distributed 3,750 hygiene kits, 1,500 sleeping bags, and 800 blankets. To help improve the living conditions of this population, MSF addressed its concerns to authorities asking for a humanitarian intervention for all migrant workers, regardless of their legal status. As a result, regional authorities in Puglia, Calabria, and Campania undertook emergency measures under MSF supervision to ensure basic living conditions—toilets, showers, water tanks—and adequate medical services for the 4,000 migrants working in the area. These measures followed recommendations in the MSF report “A Season in Hell”, which exposes the deplorable health, work, and living conditions of migrant workers in southern Italy. 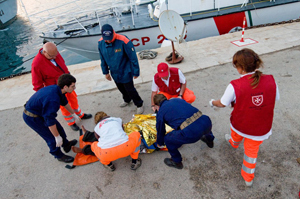 MSF started providing emergency medical care to undocumented migrants and asylum seekers landing by boat in Lampedusa, southern Sicily, in 2002. Since 2005, MSF has treated 4,450 people, including 1,420 treated between January and October 2008. Each year, thousands of migrants arrive in Lampedusa after harsh boat journeys across the Mediterranean Sea to Europe. In 2008 alone, almost 30,000 people are estimated to have landed on the island. Those who survive the journey arrive exhausted and dehydrated, suffering from respiratory infections and skin complaints caused by overexposure to salt and water, as well as burns from fuel accidents. An MSF team assesses their medical needs, stabilizes the patients upon landing as needed, and accompanies the most serious cases to health clinics or the migrant reception centers. MSF staff and others help a sick passenger who arrived on a boat from Libya. Throughout Italy, MSF’s work with migrants is carried out with the support of cultural mediators who help bridge communication and cultural gaps between the team and the patients. MSF also strives to ensure that patients are aware of their rights to healthcare. 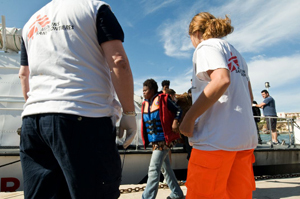 MSF has worked with migrant populations in Italy since 1996. Throughout the years, the work has been marked by strong lobbying efforts to guarantee better access to healthcare and reception conditions for undocumented migrants and asylum seekers. Greece is located on the border of the European Union, at the crossroads between Asia, Africa, and Europe. The 2001 Census recorded nearly 800,000 foreign nationals in the country. This figure, however, does not include the migrants, refugees, and asylum-seekers who have arrived in Greece in recent years. 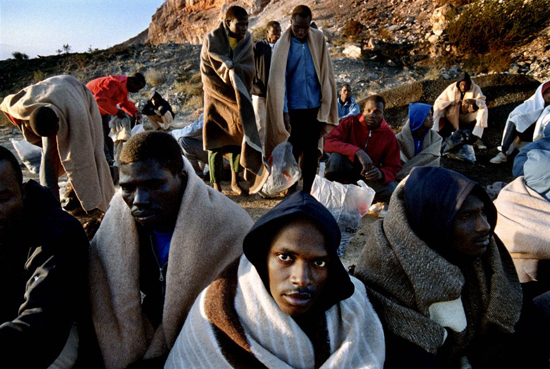 This population influx remains largely absent from official statistics, yet it comprises more than 200,000 of the total estimated 1.2 million migrants in the country. The majority of people arriving without legal documents originate from Afghanistan, Iraq, Palestinian Territories, and Somalia. In 2008 alone, more than146,000 people were arrested for entering Greece. For these arrivals, Greece is usually a transit location on the way to Western and Northern Europe. However, Greece holds a fairly poor record with regards to granting refugee status: out of a total 29,000 applications submitted in 2008, only 0.05 percent of the asylum seekers received refugee status. Following an overall review of the situation of undocumented migrants in Greece, MSF decided to conduct an exploratory mission in February 2008. he results revealed the urgent, unmet needs of these populations. The main port of exit from Greece to Italy is located in the city of Patras. While in the last decade there has been a constant influx of migrants, refugees and asylum seekers, in the last two years the number of these populations has increased considerably. The makeshift camp in Patras is in fact a shantytown without heating or electricity, which mainly hosts migrants from Afghanistan. In May 2008, MSF opened a clinic inside the camp for the provision of primary health care services and psychosocial support. In addition, the teams carried out regular information and sensitization activities for the camp population on hygiene, sanitation, and disease prevention. Moreover, MSF ran mobile clinics to support the populations that were living in deplorable conditions at the beach near the port. The migrant population’s main medical problems consist of skin diseases, respiratory infections and gastrointestinal disorders. Bruises and injuries are common, as a result of the frequent attempts to board ships leaving from the port or to avoid being arrested. Up until the end of April 2009, the MSF teams had carried out more than 8,000 consultations. Within the same period, the MSF psychologist had carried out 394 individual consultations and 60 group counseling sessions. MSF was also involved in improving the living conditions of the population inside the camp. Since April 2009, MSF has distributed more than 880 sleeping bags and approximately 460 hygiene kits to the people living in and outside the camp. MSF staff hand out water to people who have just landed in Lampedusa. Responding to the unmet needs of the migrants, refugees, and asylum seekers in Greece, MSF launched an emergency intervention in June 2008. The organization started working in the detention center on Lesbos Island and at the landing point at the port, providing medical, psychological and humanitarian assistance to migrants. However, MSF decided to end the intervention in September 2008 due to its limited access to the patients. Overall, MSF was able to carry out more than 1,700 consultations at the detention center. MSF is planning to start interventions detention centers in Evros and Rodopi, in Northern Greece, providing mental health and psychosocial support to undocumented migrants, refugees, and asylum seekers. At the same time, teams will explore the needs of these populations in Athens. Since such populations are in constant flux, MSF is monitoring the overall situation in order to provide continued assistance to these vulnerable groups. 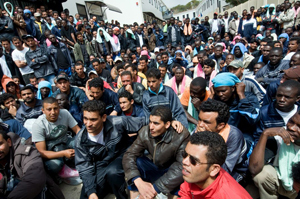 Morocco is a place of transit and enforced stay for migrants from sub-Saharan Africa. The presence of migrants in some rural areas of Oujda, on the border with Algeria, has led to regular raids by Moroccan security forces looking to track down undocumented migrants. In cities such as Rabat and Casablanca, home to some 5,000 migrants, security controls are also ongoing. Although in 2008 we have seen less direct violence committed by the Moroccan security forces against the migrant population, migrants were still exposed to all kinds of abuses and violence by other actors, for example human-trafficking networks. MSF teams in Rabat, Casablanca, and Oujda run curative and preventive healthcare activities, providing direct medical attention and facilitating access to MSF health facilities. In 2008, MSF provided 4,035 consultations, including 753 cases of violence—18 percent of the total number of consultations. MSF also lobbies authorities and other civil society actors to assume responsibility for migrant health. 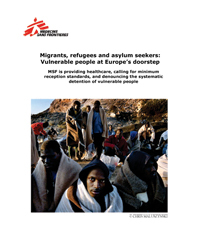 In 2008, MSF presented a report on violence and migration to authorities in Spain and Morocco. Because migrants are forcibly detained in Morocco, risky behaviors have started to appear, linked to activities that generate economic income. These activities include sexual exploitation, prostitution, and forced labor linked to human-trafficking networks. As a consequence, migrants face new health problems linked to sexual and reproductive health. In addition in 2009, MSF could see a large increase in the number of women and children under five among the migrant population.